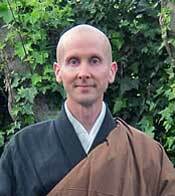 Kokyo Henkel is the resident teacher at Santa Cruz Zen Center. Prior to assuming his current position, he practiced at Tassajara Zen Mountain Center, Green Gulch Farm Zen Center, No Abode Hermitage in Mill Valley, and Bukkokuji Monastery in Japan. He was ordained as a priest in 1994 by Tenshin Anderson Roshi and received Dharma Transmission from him in 2010. Kokyo enjoys studying the original teachings of Buddha-Dharma from ancient India, China, and Japan with an eye to their relevance in bringing peace and harmony to this troubled world. The fee is on a sliding scale of $20-$60, according to ability. No one will be turned away for lack of funds. You will be invited to give an additional teacher donation on the day of the retreat. For questions, please contact Sarah at sarah_ogara@yahoo.com or 916-484-6808.